Subaru Forester – No slouch when it comes to cargo capacity, the 2010 Subaru Forester has 68.3 cubic feet of storage with rear seats folded and 33.5 cubic feet with the 60/40-split rear seatback raised. Forester also features a long cargo floor and the vehicle is not too far off the ground, making loading and unloading items easier. Edmunds comments: “The Forester is one of the most spacious vehicles in the segment, comparing favorably with the RAV4, CR-V, and Mitsubishi Outlander, all of which bridge the gap between compact and midsize SUVs. Like all Subaru models, Forester comes with standard all-wheel drive. 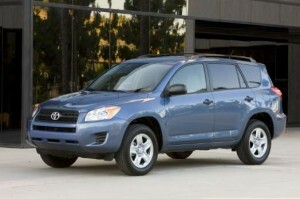 Also check out Chevrolet Equinox, Ford Escape, Mercury Mariner, Mazda Tribute, Hyundai Tucson, and Kia Sportage.